UCI came off of a historic 30-5 season, which included a blowout win against Cal State Fullerton in the conference finals, as they punched their ticket to this year’s big dance. Kansas State went into the game with a 25-8 season from the Big 12 Conference, led by head coach Bruce Weber. The Anteaters looked to continue their hot 16 game winning-streak into the tournament, as they needed all the momentum they could muster facing nationwide competition. The Wildcats had the early advantage, as they were able to shake UCI’s usually stellar and efficient offense in the first half;Kansas’ defense made it difficult for Irvine to penetrate the lanes and get any sort of easy looks. Kansas was also able to make Irvine commit some costly turnovers, which led to possessions down the stretch. This initially bothered Irvine’s rhythm, but were able to come together during the final minutes after being down by 10 points. Senior forward Elston Jones was a huge factor in the paint, creating shots with his post moves and converting on crucial and-one opportunities. Junior captain Max Hazzard also stepped up his game, getting to the free throw line and converting on big buckets from behind the arc, getting hot handed as it gave UCI the edge. Hazzard was able to cap off the 10-point-turnaround by hitting a step-back three pointer at the buzzer to even the score at 30 apiece heading into the second half. Hazzard had the whole stadium in San Jose buzzing with excitement for hopes of a potential upset. The Anteaters shot 40.7 percent from the field compared to Kansas State’s 35.7 percent. Things were neck and neck throughout. In the second half, the Anteaters showed the whole country why they were not ready to go home, that their season is still alive and breathing. 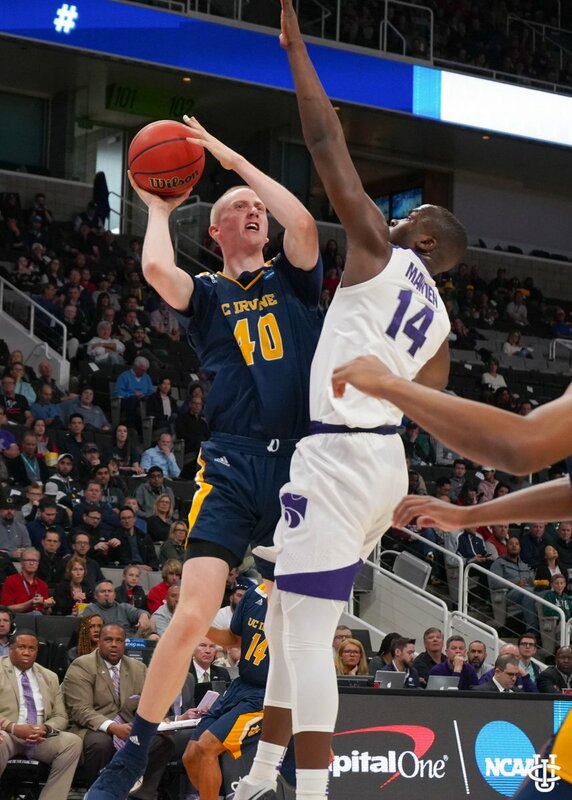 Hazzard and junior guard Evan Leonard completely took over the show for UC Irvine, as they scorched from beyond the arc, hitting contested shots when it mattered most. Both guards erupted for 19 points each, combining for 7-15 from three point land and giving the Big 12 powerhouse a run for their money. The Anteaters were able to improve their shooting percentage to 47.8 percent in the second half, as their points in the paint (24) gave them the advantage down the stretch. But Kansas State wasn’t the fourth seed for nothing, as they kept clawing their way back anytime Irvine started to get a little hot. The Wildcats’ Kamau Stokes took control of his team’s offense and went off for 18 points of his own, hitting tough shots from the wing that had everybody at the edge of their seats at the SAP Center. UCI players Jones and graduate student Robert Cartwright scored double figures of their own, propelling their lead and ruining Kansas’s defensive gameplan coming out of the half. UCI’s adjustments on both sides of the court showed that they were locked in to pull the upset and break brackets all over the nation, continuing their unbelievable winning streak. And that they did. Irvine was a different animal in the second half, as every player on the floor contributed, giving life to the ‘Eater nation faithful who traveled north and was in attendance for the dramatic match-up. 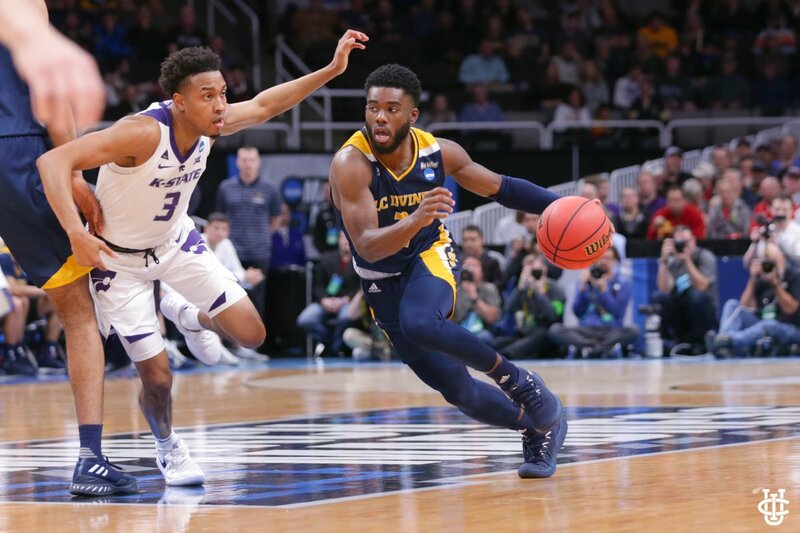 With their victory,the Anteaters’ got their first national tournament win in school history, beating the fourth seeded Kansas State Wildcats 70-64. Head Coach Russell Turner got emotional after the win and gave his take on what advancing means and what value it holds. “It’s special on a personal level, with any goal, that you set and reach… It is gratifying to see how much our success means to so many people. That’s gratifying, on a personal level. But, I know that that’s the product of a lot of people working together and believing, and, it’s kind of nice when, your belief is validate,” Turner said as he choked up in what seemed to be tears of joy filling his eyes, further displaying his passion for the game. UCI will look to continue this magnificent run as they face the Oregon Ducks this Sunday in San Jose, CA in the round of 32.